Gift giving on a budget can be a tricky thing to master. When economic times are tough, big ticket items are the first things cut out: cars, houses, vacations and recreation, etc. However, small ticket items can flourish: rental movies, low-cost toys, fashion accessories, home accents, etc. The reason people buy more of the little things is that people want to feel like they can still spoil themselves, even in a small way. One of the beauties of buying handmade online is that you can directly message the seller. If you are buying a gift item, ask if there is a direct ship option. Most Creators would not be adverse to also wrapping the package up for your recipient and enclosing a little "to / from" gift enclosure. Gifts that are two-in-ones are the best! Refillable items are gifts than can keep on giving! I have an example in my shop of a refillable card case. Any standard sized cards can fit, so you aren't limited to the refills from my shop only! 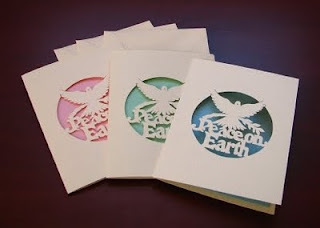 I have even seen some cards where a removeable bookmark or earrings make up part of the card's display. Also consider buying a more artistic card that you can later frame for room decor. 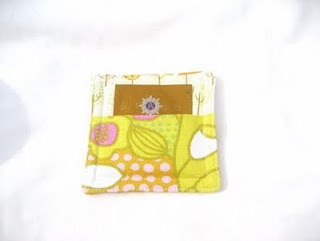 Another good double duty item is this fabric pocket coaster by BoutiqueKarma which allows you to insert a gift a long with the coaster, whether it be a packet of tea or coffee, the fixings (sugar or sweetner packets), or the finishing touches (a small bag of mini-marshmellows for cocoa or a couple of chocolate dipped stir sticks / plastic spoons). The great thing about handmade gifts is that they are unique. Your gift will stand out from everyone else's. (I'm not saying store-bought gifts can't be unique or inventive; I'm only saying it is less common in a manufactured environment so you might spend more time looking for it.) When you can't afford to buy a big, fabulous gift, give something small, but unique. Such an item says, "I think you're special" and not "I think you're worth $X". (How many of us do that? For a family member's birthday you spend a certain amount but for a friend who isn't your best friend, something of lesser amount? Maybe you won't say it out loud but you're nodding your heads, aren't you?) Time to stop thinking, "What can I get for $X?" and start thinking "What would So-and-So like, really?" Many online venues are willing to redeem coupons and giftcards. Again, all you have to do it ask. All the Creator has to do is give you a unique coupon code. It is always best for the buyer to indicate that they have a coupon or giftcard and what product they woud like obtain with it before adding the item to their cart. The Creator can make a custom listing for the buyer and take the discount or giftcard denomination off the top. (It's not very different from a restaurant. They usually ask you before billing whether you plan to use a coupon or giftcard!) This way, your recipient is SURE to get something they like, because they can choose it themselves! I hope these ideas help you with your shopping. Handmade gifts don't have to be budget busters. If all you can give is something small, then make it count! I enjoyed reading your post. It is well written with lots of good ideas. A handmade gift taylored to the recipient is always appreciated.